We often hear from educators that students need to be able to self-regulate in order to be successful in school. But what exactly does that mean? Self-regulation is the ability to monitor and manage emotions, thoughts, and behaviors. It’s what helps children focus their attention on learning when they might be distracted by others, frustrated by a problem, angry with a friend or over excited about an upcoming event. 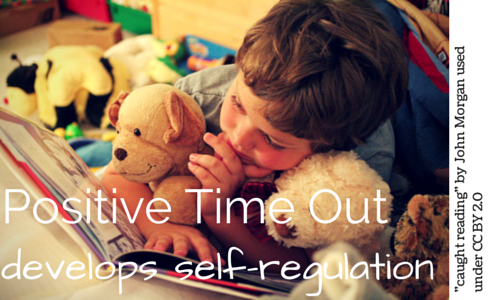 The ability to self-regulate helps children get along better with peers and teachers. Lack of skill in self-regulation is one of the things that can be frustrating in the classroom and on the playground. The good news is that we can explicitly teach and practice self-regulation skills with our students and help children self-regulate better. Giving children the space to cool down can be a powerful opportunity for them to develop and practice skills in self-regulation. Invite your students to help you create a Positive Time Out space in your classroom. Time out has many punitive associations in our culture, but a Positive Time Out provides the space and tools that encourage self-regulation and self-calming in your classroom in a way that is both helpful for the child with the flipped lid and non-disruptive for the rest of the class. More information for parents is here. After you teach your students about the Brain in the Hand and you have practiced naming and recognizing emotions, begin to ask them about how you can together create a space in your classroom for people with flipped lids to close them (calm down/re-gather). Brainstorm the kinds of supplies, decorations and guidelines that will help the person with the flipped lid to calm down in a way that is quiet so it won’t be disruptive, but still helpful. Remember, this doesn’t have to be a big space in your classroom – you can use just a comfy chair or one corner with pillows. Because this space is helpful, not hurtful, and you want to encourage students to develop skills in self-regulation they can use when on their own, it is important to never force use of the Positive Time Out space (i.e. as a consequence). Instead students can choose to go there on their own or be invited (reminded they have the option) to go there, not because they are in trouble, but because they might find it helpful for calming down. They stay in this space for as long as they wish to, as they calm down, not for a specific or set amount of time. Be sure to practice using the space, especially with younger students. Role-playing using the space is a great way for children to develop muscle memory and connections. If they have gone there in play and practice they will more likely use the space when they are “flipped”. As a teacher, it is very helpful when you get to the day when a student, who previously would have been quite disruptive, is able to quietly head to the “cool down zone” and draw for a few minutes before quietly returning to their seat! A special name for the space like “Calm Land, Outer Space, The Nest, Alone Zone, Peaceful Place, Cool Down Spot” etc. Items that invite calm like a comfy pillow, squishy balls, a teddy bear, clay, soft music with headphones, feeling faces chart, crayons and paper, books, etc. Remember that different things work for different people so be sure to a variety of items. Decorations that promote a positive, calming association with the space like inspirational quotes and images, landscape/scenery photos, etc. And… adults benefit from “Positive Time Out” too. Using the space for a minute or two to model is a powerful way for children to learn that it really is not a punishment. This entry was posted in Self regulation. Bookmark the permalink.